The coursework for the Introduction to Modern Calligraphy workshop is aimed for complete beginners. No experience necessary, and you'll leave with serious industry insight. 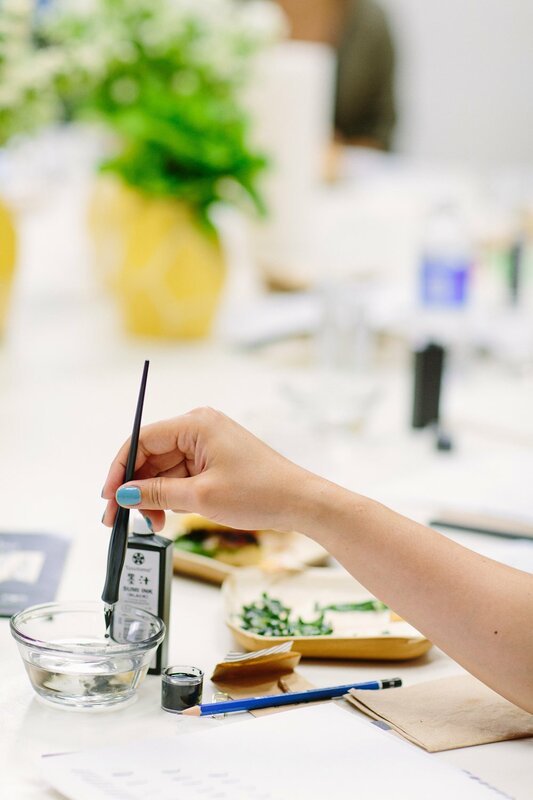 All workshops include a full starter kit to take home with all the tools you’ll need: ink, nibs, recommended paper, customized instruction booklet and more. This hands-on course provides a detailed foundation of history of calligraphy, in-depth techniques of pointed pen, one-on-one attention and correction of technique, and of course small bites and wine. Each workshop is in a small intimate setting and spaces are very limited. Due to the costs of supplies and specific pre-planning that goes into these events, reservations for workshops are non-refundable - no exceptions. Contact us if you're interested in setting up a workshop near you. Instructed by Taryn Sutherland Gross, owner & designer of Twinkle & Toast.